Jurors in the corruption trial of former Illinois Gov. Rod Blagojevich said Thursday that they have reached agreement on just two of 24 counts against him, and haven't even begun discussing 11 of the counts. The judge quickly said he would tell them to go back and deliberate more. The exchange once again left the courtroom in a state of uncertainty, with lawyers and legal experts saying there is no way to know for sure how long the deliberations may go on - but some saying the apparent deadlocks on some counts were a good sign for Blagojevich and his co-defendant brother, Robert. The 11 counts the jury has yet to discuss involve wire fraud. Most of them deal with FBI wiretap recordings and the allegation that Blagojevich tried to sell or trade President Barack Obama's old Senate seat. The jurors did not say which two of the 24 counts they had agreed on, nor what their decision was. Little Known about Blagojevich Jurors Blagojevich Jury Heads Home For Night Should His Kids Be in Court? Former state appellate Judge David Erickson said the jury's apparent deadlock on 11 counts looks good for the defense. He said if a panel of 12 jurors can't come to an agreement, it shows some have doubts that prosecutors made their case. "To this point, if we were keeping score, I think the defense strategy worked spectacularly," said Erickson, now a law professor in Chicago. The defense did not call a single witness, including the former governor himself, and argued that Blagojevich was a big talker, but never committed a crime. Erickson said when judges tell jurors to deliberate more, they often return quickly with a verdict. Others believe the jury may need some time to work through the remaining counts. Michael Helfand, a Chicago attorney not involved in the case, said he expected jurors to tell the judge soon that they are hopelessly deadlocked. "The defense has every reason to be thrilled," he said. "This jury has been deliberating for such a long time the chances of someone changing mind now aren't good." Others believe the jury may need some time to work through the remaining counts. "If they haven't addressed the wire fraud counts, we're going to be here until next week," Richard Kling, a professor at Chicago-Kent College of Law, told WLS-TV. Joel Levin, a former federal prosecutor, said one major question is why the jury has not even discussed any of the wire fraud counts. He said jurors may feel they can't discuss that until they decide on other charges. But he said it could just as easily be one or two jurors are "really digging their heels in" on other counts and the jury has just not gotten to the wire fraud counts. He said what is particularly baffling is that there have been no notes of substance to the judge throughout deliberations. "Given they've accomplished virtually nothing you would have thought we'd heard something," he said. Blagojevich did not comment after the hearing. "He seems to have enjoyed the attention, often playing to the crowd," reports CBS News correspondent Cynthia Bowers. But asked if he felt it was good news for his client, Blagojevich attorney Sam Adam Sr. responded, "I don't know. I've learned a long time ago not to guess what juries are thinking." Blagojevich and his co-defendant brother listened intently, sitting at the edge of their chairs, as Judge James B. Zagel read the jury note. After the hearing adjourned, the ex-governor quickly smiled in a huddle with attorneys. He put his arms around his wife Patti's shoulder. The jury had sent a note to Judge James B. Zagel on Wednesday saying they were stuck, but without giving specifics. He had asked for clarification. The fact that jurors didn't specify which counts they've agreed or disagreed on could be crucial, especially when it comes to arguably the most serious charge - Count One, racketeering. Prosecutors front-loaded the indictment, requiring jurors decide as they considered that racketeering charge whether Blagojevich committed more than 20 separate illegal actions, from trying to sell the Senate seat to squeezing a construction executive for campaign cash. Many of the other charges, including wire fraud, rely on whether jurors have already agreed Blagojevich committed the long list of actions under racketeering. Asked if Thursday's note suggests jurors are bogged down on racketeering, Blagojevich attorney Sheldon Sorosky agreed. "Yes, it does seem to," he said. Blagojevich, 53, has pleaded not guilty to charges including that he tried to sell or trade the Senate seat appointment for a Cabinet post, private job or campaign cash and tried to leverage the power of his office for personal gain. If convicted, he could face up to $6 million in fines and a sentence of 415 years in prison, though he is sure to get much less time under federal guidelines. His brother, Tennessee businessman Robert Blagojevich, 54, faces four counts and has pleaded not guilty. Judges have a lot of autonomy about what to do in case of deadlock over some or all counts, said Michael Helfand, a Chicago attorney with no link to the case. Besides sending them back to keep trying, a judge can ask jurors if there's anything he could provide that might help them reach a verdict - for instance, transcripts of specific witness testimony. 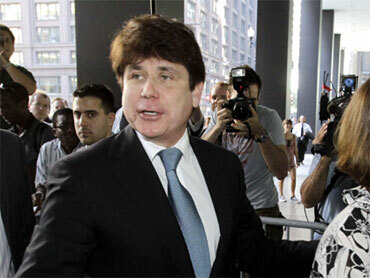 Zagel praised the Blagojevich jurors on Wednesday, calling them disciplined and diligent. Any discord has apparently been civil, Zagel told the court, with no reports of shouting or screaming from the room where they gather each weekday. "Even though we feel like they've been deliberating a long time, given the number of counts, they really could keep at it longer," said Nancy Marder, a professor at Chicago-Kent College of Law. "Jurors don't have a sense of how long is long." The charges may have been too complicated, reports Bowers, and despite hours of audio recordings of Blagojevich's conversations, there's no real smoking gun. The judge sent the jury back to work but told them they don't have to reach a unanimous decision on every count. Their deliberations will resume on Monday.